A simple, soft and chewy granola bars recipe that’s delicious as-is or can be adapted based on your favorite dried fruits, nuts or chocolate. Jump to the Granola Bar Recipe or read on to see how we make them. We have a history with granola bars. A while back, we shared a cooking failure. The subject was granola bars. They tasted great, but fell apart. So, we sort of gave up and moved on with the thought that one day, we would be ready to give them another shot. After two years, we’ve picked up where we left off and have now figured out how to make these simple, soft and chewy granola bars. We’re in love. They taste great, are incredibly easy to make and they absolutely do not fall apart (see our tips below). We all struggle with what to cook for dinner and yes, I am definitely including Adam and I in that! 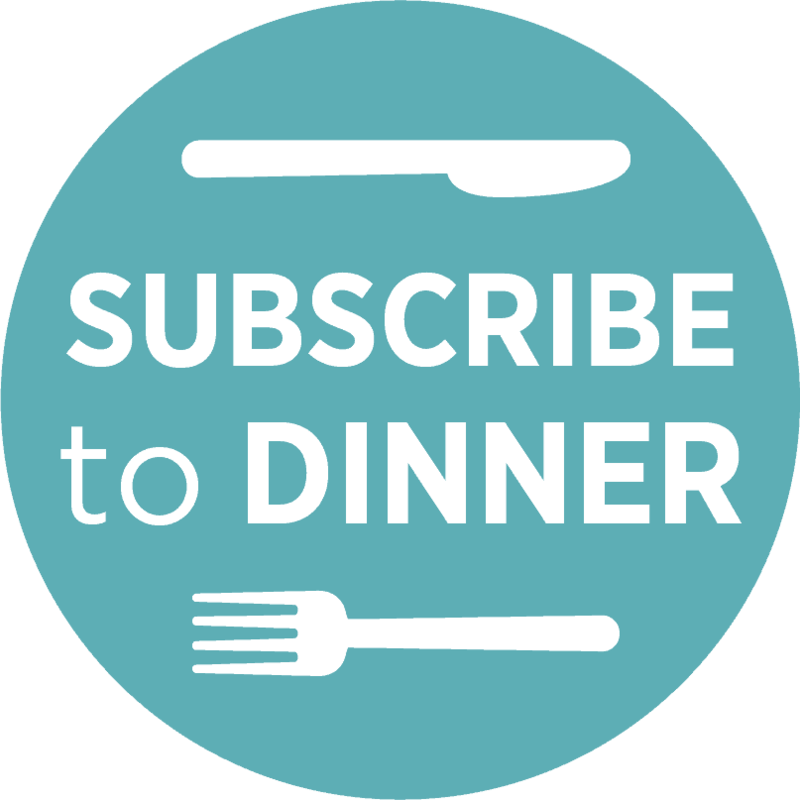 So you never run out of inspiration, we want to send you a completely free weekly email with easy, delicious and fresh recipes perfect for dinner! Click here to sign up for free now! We’ve made these many times now and every time, they’ve been just a little bit different. Here, you see whole almonds, dried cranberries and mini chocolate chips. We’ve also used dried cherries, apricots and unsweetened coconut. We’re even thinking about adding pistachios next time. The possibilities are endless — all you need to know is the base. Oats, butter, honey and brown sugar. After that, add what you like. YOU MAY ALSO LIKE:How to make healthy banana blueberry muffins that actually taste good! We add whole grains, ripe bananas and reduce the sugar. Most importantly though, they taste great! 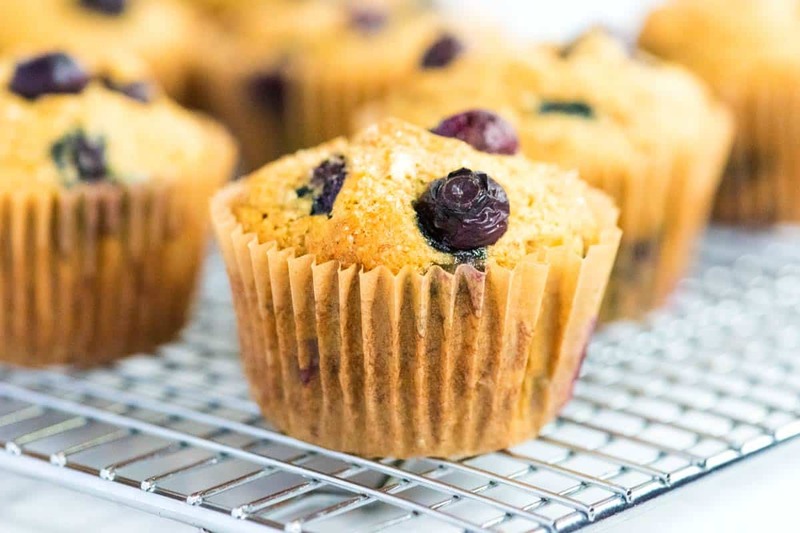 Jump to our Healthy Banana Blueberry Muffins Recipe. After a few tries, we’ve found that it’s really important to press the granola mixture into the pan. We’ve actually spent about a minute pressing before — the harder and longer you press, the less chance you’ll end up with granola instead of granola bars. The honey and brown sugar really helps with keeping the bars together. Chocolate chips added to the mixture help, too. We add some to the granola mixture while it is still warm. You might notice some of the chocolate melts — this is totally okay, it acts as extra glue, holding the bars together. After that, we add more chocolate chips to the top — these don’t melt. Finally, we like to refrigerate the granola mixture for about 2 hours. This hardens everything and makes it easy to cut the granola mixture into bars. Right out of the refrigerator the bars will be hard since they are cold. Leave them out for an hour and they will warm to room temperature and become a little softer and chewy. The bars keep at room temperature for about 1 week (if they last that long). Just make sure they are tightly covered or sealed in a container. 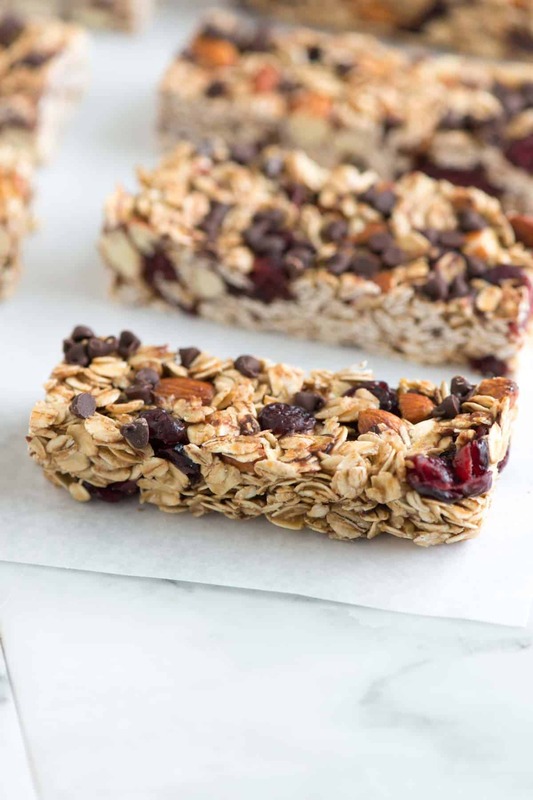 These granola bars are so much better than what you can by at the store, especially since you can substitute for your favorite dried fruit or nuts. While these are very simple to make, there is a 2-hour wait for the bars to firm up enough to cut. Feel free to add your favorite dried fruit, nuts or chocolate to these – it’s completely up to you. Since we use a 1/3 cup of honey, we like to splurge on higher quality honey. Heat oven to 350 degrees F. Line bottom and sides of a 8-inch or 9-inch square pan with aluminum foil. Then lightly oil or spray with cooking spray. Pour butter mixture in to bowl with toasted oats and almonds. Mix well. Let cool about 5 minutes then add cranberries and a 1/4 cup of the mini chocolate chips. Stir to combine. (The chocolate chips will most likely melt a little. This is fine, they turn into glue and help to hold the bars together). Scatter remaining 2 tablespoons of chocolate chips over pressed granola mixture then use a rubber spatula to gently press them into the top. Cover then refrigerate at least 2 hours. Remove block of granola mixture from pan then peel away aluminum foil. Cut into 12 bars. These are great! And actually chewy! I sprayed a cupcake pan with cooking oil and made 12 of them. Worked very well. I’m making these again tonight. Fantastic granola bar! My husband and I have been looking for this bar that is not too sweet and full of yummy goodness. We did make a couple of changes by replacing 1/2 a cup of the oats and put a 1/4 cup of flax and 1/4 of hemp plus instead of chocolate chips we put in sunflower seeds. Boom! These are delicious! I added a little extra chocolate just because I love it and they are so good. I can’t stop eating them. Thank you! Thank u for this great recipe. My entire family liked them. They are easy to make,& stay soft & chewy. I’ve been making these regularly for a few weeks, and I wanted to add that I boil the honey/sugar/butter mixture on the stove for a few minutes. Not enough to get it to the soft ball stage (I’ve never used a thermometer), but enough to get some of the water out of the butter and make the mixture a little stickier. Works well. I boil about 3 minutes. My fave fruit/nut combinations are dried apricot/cashew/dark chocolate, dried cherry/almond/white chocolate, and cranberry/almond/white chocolate. These look to be exactly what I am looking for. We host a monthly men’s prayer breakfast for the men of our church. The early birds who come for some fellowhip before the rest of the group like something to nibble on with their first cup of coffee and while I am finishing the rest of the breakfast. These will be perfect! I need to do as much ahead as humanly possible! These are amazing! I’m celiac so I used gluten free oats and these are better than any gluten free granola bar out there! So inexpensive to make as well. I had no dried cranberries so subbed unsweetened shredded coconut and it was delicious.thank you! These are AMAZING! I added sunflower seeds along with the almonds and I think I ate half the batch alone. Highly recommend. We absolutely love these! We are all organic/natural and make a double batch every month, they freeze very well. Your combination of the the honey, butter and brown sugar is perfect—we tweeked ours and didn’t do the chocolate chips but use walnuts, almonds and dried cranberries and blueberries. 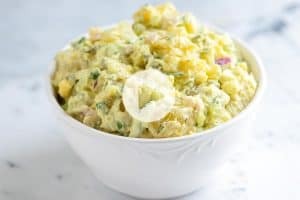 Thank you so much for this recipe—I’m asked bring them for every pot luck at work. I am a little confused. You don’t bake the mixed ingredients in the oven? Just toast the nuts and then pour on the heated honey butter etc? Hi. 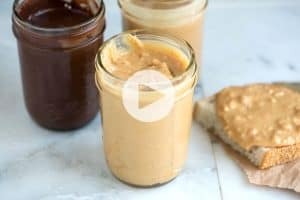 Could I use maple syrup instead of honey? If so, how much would I use? Hi Marla, We’ve always used honey in the bars, but other readers have used maple syrup. I’d use the same amount as the honey called for in the recipe. 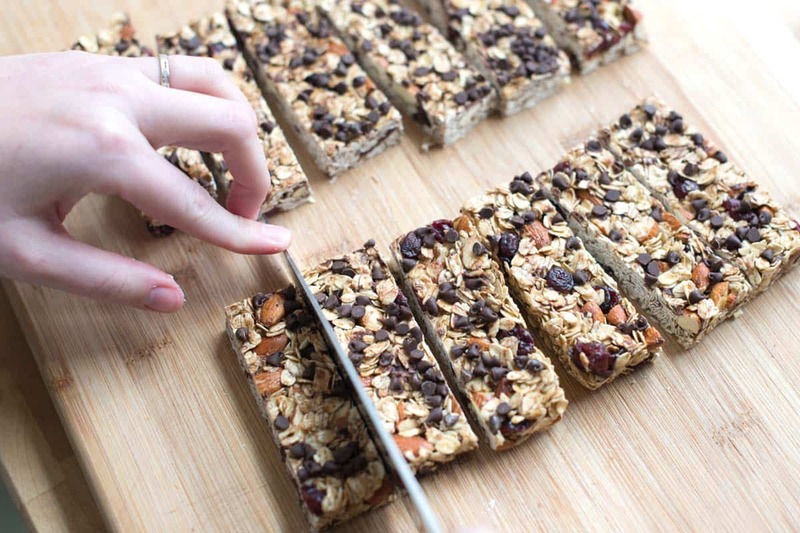 I have loved this recipe for granola bars for a few years now. Lately have been using organic everything I can. I found a new favorite I wanted to suggest – using dried pineapple tidbits cut to size of raisins and use white chocolate chips. Totally makes me wake up three hours early in the morning just looking forward to eating one with our coffee! 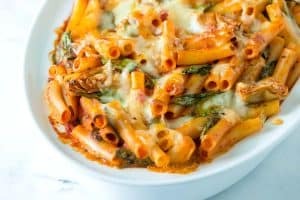 Yum and thanks for posting this recipe!!! These are really addicting! So much better than store bought! These granola bars are delicious! These are so good! I have allergies to fruit so it is very hard for me to buy bars in the stores. 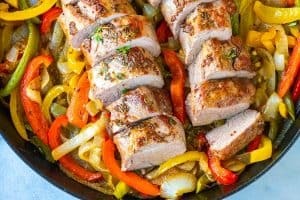 This is definitely my go-to recipe. I substituted quick oats to make easier to digest, and substituted peanuts for the almonds. I also used Manuka honey, which has a distinct flavor, added some molasses, and used regular size chocolate chips, which look huge on the small bars, but fun looking. These granola bars turned out amazing! They are easy, tasty and my kids love them. The video was also very helpful. Thanks so much for this recipe! Thank you for this delicious granola recipe. Everyone loves them. I subsitute coconut oil for the butter, use unsweetened chocolate and cocoa powder for the chips. Use food processor for oats, dried fruit and nuts. Makes it easier to cut. Make 32 pieces.